Our breathtaking new "Mercury" Chandelier decoration is very similar to ones that you'll see for several hundred dollars on other sites. 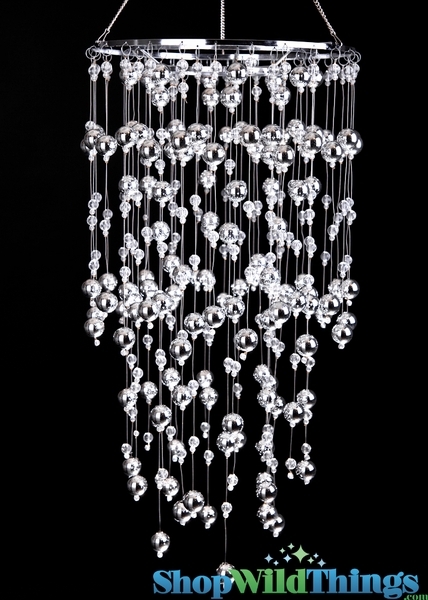 We've had these amazing silver balls and high quality crystal clear acrylic balls threaded onto thin steel wire for a shiny and yet high-end looking finished piece. There are 3 layers of beads! 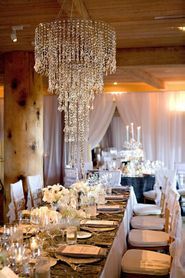 This is a chandelier decoration and does not include a light kit. So many of our customers just want these to hang anywhere and do not want the electrical cords. If you do want to use an electrical cord kit and light bulb, we sell them separately here - LIGHT CORD KIT. There is hardware (inset photo) in the center that will hold the light kit in place. 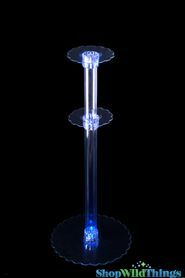 You might also consider using our LED lighting to insert on top of these. They are very easy. You just slip an LED Disc on top of the fixture and turn it on SEE THE CORDLESS LIGHT DISCS HERE. This item is 24" Long (plus a hanging chain) and 12" in Diameter. The first time it was shipped, it was quite tangled and broken. I called and they immediately sent out a replacement. This one was packed very carefully and was absolutely beautiful. Tina took VERY good care of the situation! Merchant Response:Thank you so much for sharing with us. We love our customers and always want you to have a pleasant experience and we agree, Tina is awesome!! !